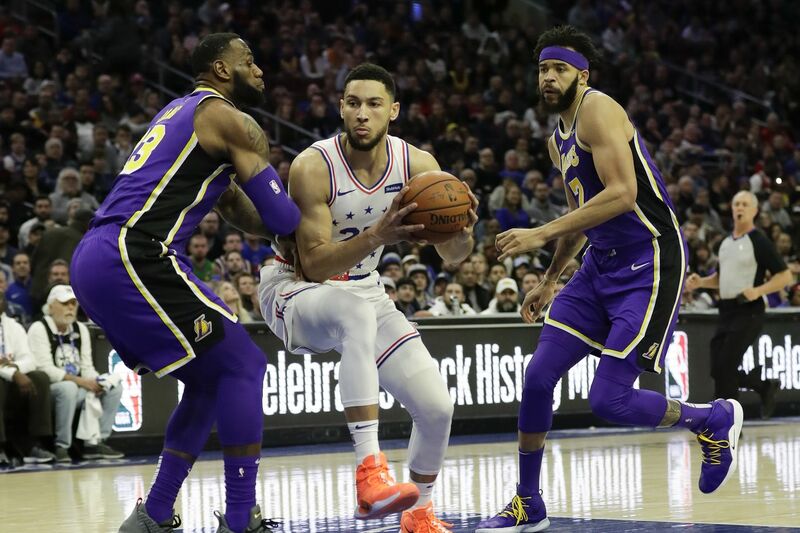 Ben Simmons drives to the basket past LeBron James (left) and JaVale McGee. Magic Johnson disclosed Sunday that he enjoys watching Ben Simmons play. And if the NBA signs off, the Hall of Fame point-guard-turned-president-of-basketball-operations for his beloved Los Angeles Lakers will give big-point-guard tips to the 76ers’ 6-foot-10, 240-pounder. “He reached out to me, not to me directly, to the Lakers, to find out if we can get together this summer,” said Johnson, who the Lakers drafted with the first overall pick in 1979. "I said, 'Hey, you’d have to clear it with the league. Everybody. The Sixers sign off. We sign off. The league sign off that nothing is going on. But Johnson, the three-time league MVP and 12-time All-Star, is a big fan of Simmons’ game. He garnered his first All-Star selection last month. The 2018 rookie of the year averages 16.7 points, 9.2 rebounds, 8.0 assists, and 1.3 steals. He has eight triple-doubles. Simmons was asked if he plans to ask the Sixers for permission. Joel Embiid was asked Sunday about the addition of Boban Marjanovic to the Sixers. Marjanovic had 10 points on 5-for-6 shooting to go with one block in Sunday’s 143-120 victory over the Lakers at Wells Fargo Center. He played 13 minutes, 24 seconds. The Serbian is averaging 7.0 points in two games with the Sixers after being acquired from the Los Angeles Clippers in a trade. Joel Embiid is convinced JJ Redick made him sick. Embiid has been dealing with a stomach virus the past two games, that he said stemmed from giving JJ Redick a hug and a handshake last week. At that time, Redick was sick. He let Redick know how bad it was in a text message in the wee hours of the morning he got the illness. Embiid decided to play on Friday against the Denver Nuggets and on Sunday as way to get on the same page with his new teammates. The Sixers acquired Marjanovic, Tobias Harris, James Ennis, Mike Scott and Jonathan Simmons before Thursday’s trade deadline.